In this page we present a novel method for MRI denoising that exploits both the sparseness and self-similarity properties of the MR images. The proposed method is a two-stage approach that first filters the noisy image using a non local PCA thresholding strategy by automatically estimating the local noise level present in the image and second uses this filtered image as a guide image within a rotationally invariant non-local means filter. The proposed method internally estimates the amount of local noise presents in the images that enables applying it automatically to images with spatially varying noise levels and also corrects the Rician noise induced bias locally. 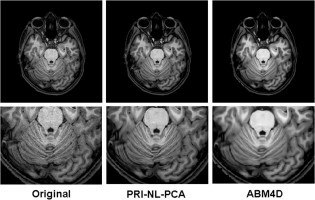 The proposed approach has been compared with related state-of-the-art methods showing competitive results in all the studied cases..
Manjón J.V., Coupe P., Buades A. MRI Noise Estimation and Denoising Using Non-Local PCA. Medical Image Analysis, 22:35-47. 2015.